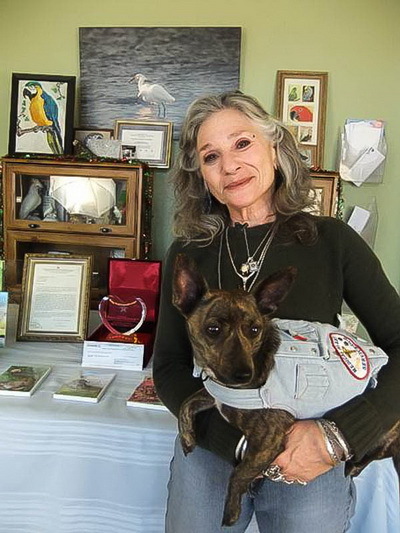 Ms. Sybil Erden of Oasis Sanctuary is honored with Shining World Compassion Award. Over 700 avian friends, including very beautiful and colorful parrots, cockatoos and macaws, are fortunate to have the Oasis Sanctuary in Arizona, USA as their lifelong home. Many of these highly intelligent and sensitive “psittacines” or parrot-type birds have suffered great trauma during their captive lives, but now they have a new start on life thanks to the loving care and foresight of the Oasis Sanctuary founder and president, Ms. Sybil Erden. 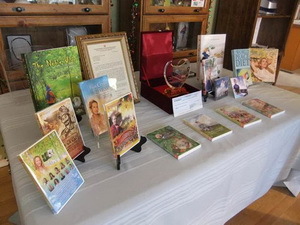 An engraved crystal plaque was also presented to Ms. Erden along with other gifts from Supreme Master Ching Hai, including Her books, DVDs and CDs, as well as vegan chocolates and cookies to share with the sanctuary’s dedicated staff. In addition, there was a contribution of US$10,000 from Master to further the Sanctuary’s compassionate work. Ms. Erden noted that the generosity has come at an extraordinary point in time and that it will be very, very helpful to the sanctuary. She explained that they were short of funds this year, and that this Award money would be used to provide food and medical care for the birds. 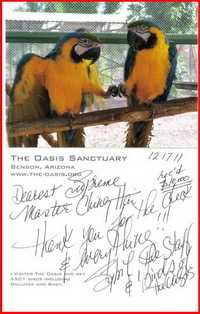 To learn more about the extraordinary work of Ms. Erden and the Oasis Sanctuary staff, and the amazing intelligence and abilities of these highly evolved avian friends, including the very talkative Great African Greys, readers are invited to watch “The Oasis Sanctuary: A Forever Loving Home for Exotic Birds” featured on Supreme Master Television.